• New dispute legislation. Up until this point, the dispute process was drawn out and costly involving court time and legal fees. The updated Act proposes the creation of a new condominium tribunal known as the Condo Authority that will oversee disputes and help with mediation. This will speed resolution times and save condo owners a lot of money. • Increased financial transparency. The government also plans to tighten rules that compel financial disclosure by developers and boards to prospective owners. In addition, rules will be introduced that may help avoid surprise hikes in condo fees from one year to the next. The promotion of clear language contracts as well as a new informational guide created by the Condo Authority for new buyers will help ensure informed purchasing and decision making on the part of owners, buyers and investors. • Training for condo board members. The province plans on creating mandatory training for directors who serve on their condo boards. Up until this point, many of those filling these volunteer roles found themselves overwhelmed and without the financial expertise required to oversee these multimillion-dollar assets. • New licensing standards for property managers. 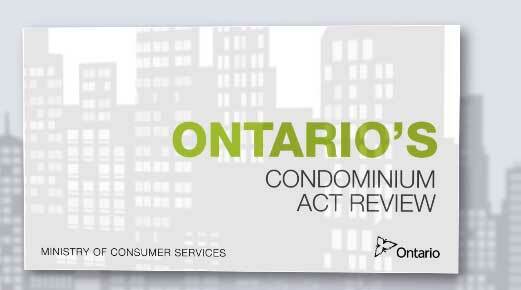 The proposed Condo Manager Licensing Authority will provide training and licensing to the more than 2500 professionals who manage Ontario’s condominiums to reduce fraud and mismanaged maintenance contracts by those few bad apples in the industry. • New construction and condo conversions. The Condo Authority also proposed limiting the number of hidden fees preconstruction buyers can be hit with on the finishing of a development as well as extending limited coverage of Tarion’s new home warranty program to developments where an existing building is converted to condos. All in all, we see proposed amendments to the Condo Act as movement in the right direction for condo owners and investors. Many of these common sense changes will help keep information transparent and all parties’ informed."